Boat shoes have been regarded as sleek, debonair footwear since the very first moment they stepped onto the fashion scene back in the 1930’s. As dapper casual wear, boat shoes prove that style doesn’t have to exist apart from functionality. These days, boat shoes are still designed to be worn on docks and boats, but they are also widely accepted as fashion shoes. Great for a day at the beach or a summertime wedding, a classic pair of boat shoes prove you don’t have to own a yacht to feel like a million bucks. Despite their name, there’s no law stating boat shoes can be owned only by those who own or operate boats. In fact, plenty of men in landlocked locations who have never owned or maybe even set foot on a boat have been known to rock boat shoes for their fashionable, comfortable qualities. Basically, what defines a boat shoe in today’s day and age is the shoe style. 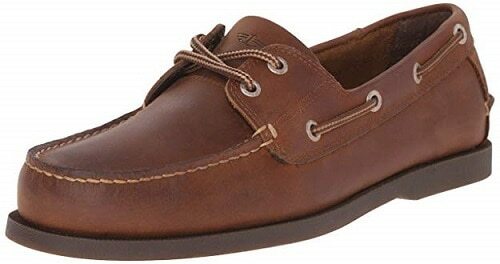 Boat shoes are similar to loafers, but generally have a set of laces that run through two to four eyelets. These shoes traditionally have a thicker, rubber sole that lifts the shoe off the ground just slightly. Originally intended to reduce water seepage in wet situations on soggy docks, these shoes still serve well in light rain and puddles. Ideal for long, lazy weekends, these shoes are the emblem of summer. They’re great for a beach walk, having lunch on the harbor, or even Monday morning at the office. In short, boat shoes can be worn when you’re actually on a boat, or just busy wishing you were on a boat during your company’s 8 AM meeting. From fashion to functionality, there’s a whole boatload of benefits to purchasing your own pair. For those seeking a summertime shoe that can dress up a pair of jeans or even be worn to the beach with a pair of swim trunks, there’s no better option. Boat shoes are the epitome of flexible footwear. You’d never wear your tennis shoes to a fancy July luncheon, but you might consider dressing up a pair of leather boat shoes for a breezy, summertime look. This makes them easily one of the most versatile shoes on the market. Sure, they’re stylish, but for the most part they’re actually very functional as well. From the shoe’s thick heel design to the fabric choice and sole, boat shoes are designed with summertime in mind. Their non-slip, gripping bottoms are great for wet surfaces, and their exposed-top, breathable designs help keep your feet both cool and protected. Style and class with comfortability. Additionally, from classic leather models to canvas variations, there’s a boat being made in almost every material, design and color. In short, these shoes allow more room for the expression of your personality, which is the entire purpose of fashion, anyway. Unlike the many styles of unforgiving dress shoes with narrow insteps, pointed toes, and hard soles, boat shoes are designed with comfort in mind. Though they are considerably more fashionable than tennis shoes or other athletic shoes, they have many of the same comfort qualities: padded soles, a more ergonomic shape, and breathable materials. So you’re sold on owning a pair of boat shoes, but you don’t know where to start. Which shoe fits you is going to depend mostly on your individual lifestyle, needs, and intended purpose. Will you actually be wearing these out on a boat, or just for summertime strolls? Are you a revolutionary rule-breaker who wants a style that pops, or a classic man looking for an elegant, nautical touch? 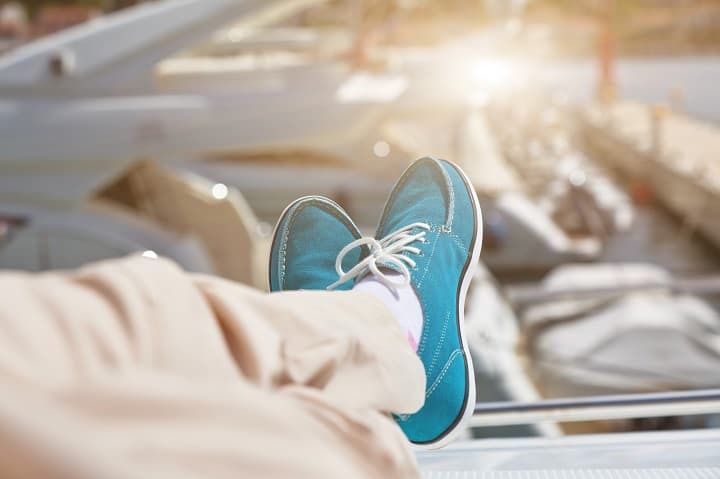 Here are a few of the differentiating factors in boat shoe styles, and what you’ll want to consider in order to walk out of the shoe store with your new favorite footwear. Leather is one of the most common materials for boat shoes, followed closely by canvas. However, because of these shoes multi-panel designs, it’s not unusual to find styles that use both leather and canvas or some variation of several materials. 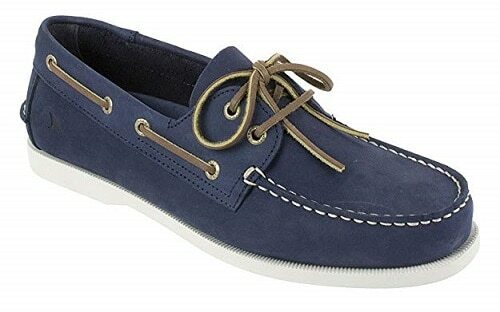 Other common materials used to craft boat shoes include faux denim, mesh, leather hybrids, suede, and faux leather. When purchasing your first pair, the material is perhaps the most important aspect to consider. Most leather boat shoes are treated to be water resistant, but will still hold up poorly when exposed to high levels of moisture. In contrast, canvas tends to fair the best in wet situations but can wear down quickly in comparison to competitors. Meanwhile, suede options are primarily for those looking to make a fashion statement, as suede and water are lifelong enemies in a war that, unfortunately for the shoes, will always be won by the lake. 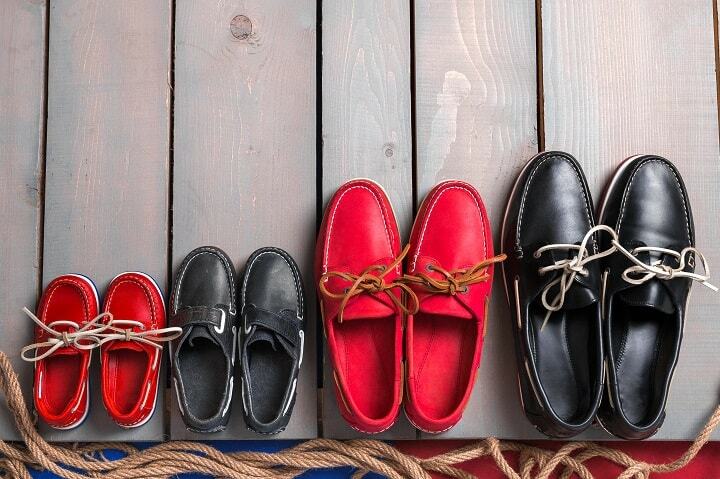 Boat shoes range from utilitarian to sleek and stylish, and from dressy to casual. The shoe’s design brings into question the pattern, color, eyelet number, cut, and overall shape of the shoe. 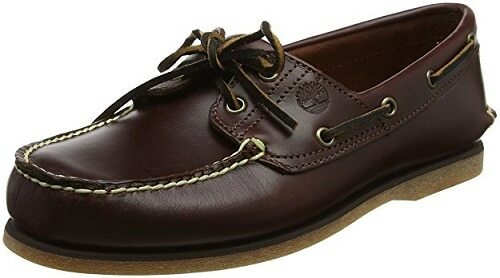 Traditionally, boat shoes have a two-eyelet design, in which the laces overlap neatly just over the shoes upper quarter, rather than extending further down towards the toe as tennis shoes do. What varies the most is color. Browns, grays, and other neutral colors are the popular, classic choice. Meanwhile, those wishing to make a statement might go with bold patterns, stripes, or vibrant colors. Traditionally, boat shoes are cut like loafers to expose the top of the foot. However, alternative designs include hybrids between boat shoes and chukka boots, which has all of the design elements of a nautical shoe, but the extended ankle and shape of a boot. These boat shoe-boot hybrids also exist in other high-topped variation, similar to the footwear on this list of best chelsea boots, but with more design characteristics of a water-resistant shoe. 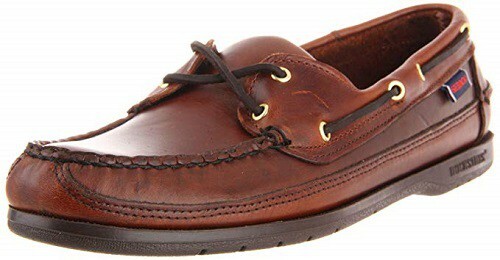 As is the case when shopping for men’s sleeping outfits or the best boxers, comfort is key when it comes to boat shoes. 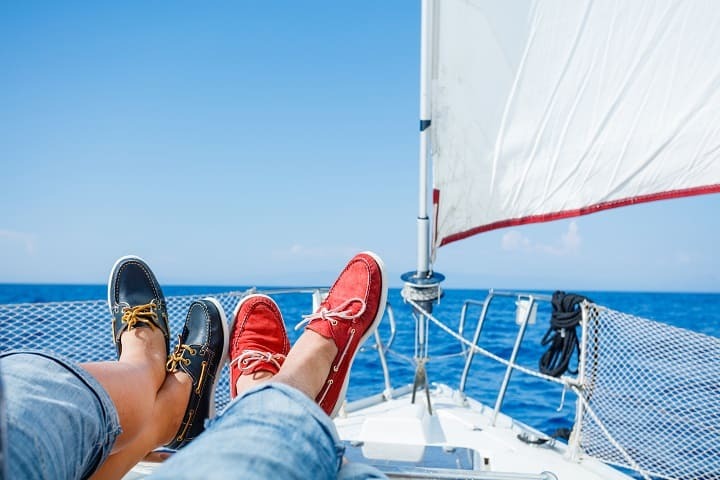 Whether you’re purchasing some as a functional pair of seafaring shoes, or simply aiming to make a nautical fashion statement, you probably want your new shoes to be as comfortable as possible. Though they may never be as cushy as any of these home slippers for men, there’s still probably a model on the market which is going to make your feet happy. For added comfort, look for ventilated inserts, padded heels, highly breathable fabric, and impact-resistant rubber soles. When it comes to footwear, so much of the comfortability rests in the sole, so look for ones are constructed out of quality materials that appropriately support and cradle your foot. These are boat shoes, not water shoes, so you’re probably aiming to stay on land. Unfortunately, if your shoes lack traction and grip, you can count on falling in. Even if your boat shoes never meet the sea, you probably want a pair of kicks that aren’t going to let you slip. That’s why grip and traction are so incredibly important. This refers not just to the shoes outside, but also the interior. Because boat shoes are traditionally worn without socks, they’re prone to slippage on the interior due to sweat. To combat this, you want an outer sole material that grips your foot and doesn’t let it slide, even if the shoe itself is wet or sweaty. Additionally, you want a shoe bottom that’s molded and slip-resistant, to help you keep both feet firmly on the ground regardless of what any choppy water might throw at you. Practical and designed with genuine leather, rubber sole and air mesh, Sperry Top-Sider Boat Shoe is both classy looking and great in performance. For ultimate comfort, its design features an amazing, molded EVA cushion midsole to provide underfoot with comfort while walking or standing. It also has a nicely fitted air mesh on the upper panel to reduce stuffiness and provide feet with breathable comfort. The interior is equipped with an EVA heel cup to help with shock absorption. You don’t have to worry about stepping on the floor with this shoe because it has a non-marking rubber outsole with wave-siping to promote dry traction. If you’re looking for a boat shoe that fits great and feels comfortable, Sebago Docksides might be the perfect choice for you. They have a fantastic construction that involves great stitching around the collar. The interior is fitted with molded EVA foam insole that’s great at absorbing shock for more foot comfort especially while walking. Their design features a genuine leather upper and a rubber outsole to increase traction. Furthermore, the outsole is slip-resistant and doesn’t leave marks on the floor. Available in various fitting sizes and different colors to choose from, this shoe allows you to actually pick a color that matches your clothes to look even more fashionable. Whenever the name Timberland is brought up, high quality, comfortable and reliable footwear is what comes to mind and that’s also the case with these boat shoes. Made from full grain nubuck leather, they’re designed with a sturdy, durable rubber sole coupled with a waterproof and rustproof upper which helps keep your feet from getting wet despite the weather. Featuring all-around rawhide lacing, they always give you a comfortable and secure fit. Their shock absorbing heel gives you effortless balance with every stride. The three-sole combination spreads the weight across your feet even with the leather-lined footbed offering non-slip support. 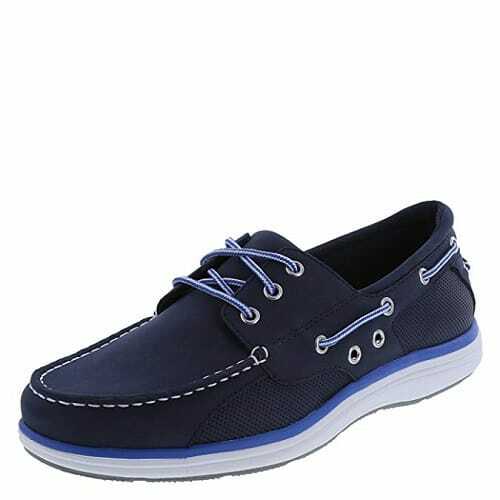 Manufactured with a heel that measures approximately 0.75 inches and a nicely cushioned footbed, Dockers Castaway Boat Shoe will provide you with exceptional comfort and long-lasting performance. It also looks classy with a design that features a genuine, full grain leather upper and hand-sewn flexible construction. You can, therefore, expect it to look great on your feet at all times. Unlike other brands, it’s made with a long-lasting rubber outsole that offers maximum traction on wet surfaces. It also has rust-resistant eyelets to promote durability. 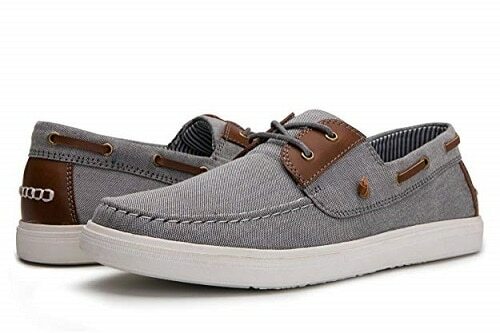 Other than the cool design, this boat shoe comes in different fitting sizes and good looking colors that can you can easily match with your pants for a greater look. Made with genuine leather and comfortable synthetic sole, Rockport is one of the most fantastic boat shoes that’s ideal for general use. It can be worn with or without socks and you’ll still experience the same level of comfort. Even though shoelace can get wider, you can simply lace them a little tighter. Designed with excellent arch support, this product also has a removable insole which you can easily replace when worn out. Great looking design features detailed stitching in the upper. This shoe is available in many colors and different fitting sizes, allowing you to find your perfect match. Fully constructed with genuine leather on the upper and non-marking rubber based outsole, Sperry Genuine 2-Eye Boat Shoe is incredibly good looking and amazing in performance. Its classy design features a shaft that measures low-top from the arch, a moccasin-stitched toe, a collar that’s slotted and corrosion-resistant eyelets for durability. To promote foot comfort, this shoe is fitted with a shock absorbing heel cup and great, hand-sewn construction for lasting comfort. The outsole is slip-resistant and doesn’t scuff to leave marks on the floor. If you like matching shoes and pants for fashion, this item will be ideal for you because it’s available in different colors and sizes. 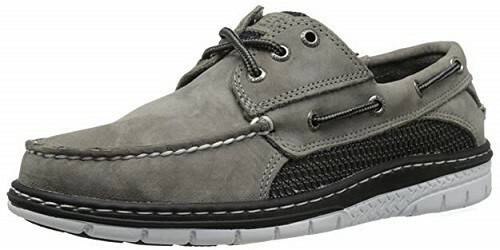 The first thing most men notice about Tommy Hilfiger Bowman Boat Shoe is their fashionable look and lightweight design. They also feature a cushioned insole and a shaft that provide your feet with ultimate walking and standing comfort. The outsole is made of rubber and is slip-resistant, while the upper looks amazing with a stitch detailing on the leather. This specific design is available in different colors and various sizes. You can easily slip them on and off since there’s not tying required. Sebago Spinnaker Boat Shoe is constructed to give you the best comfort and has a classy look that’ll improve your confidence while wearing them. The upper is made of genuine leather and the interior is designed with a soft lining on the sides, while the footbed is well cushioned for ultimate foot comfort. Its good looking design features a nice slotted collar and a moccasin stitching at the toe. It also has a shaft that measures approximately low-top arch. A long-lasting, non-marking rubber outsole offers great stability for walking and the fact that this shoe is available in many colors means you can match it with most of your clothes. Sperry Top-Sider Mako is designed with leather and other quality materials to offer your foot ultimate walking and standing comfort. Wearing this shoe also promotes confidence thanks to their elegant looking design that features a 360-degree lacing with rust resistant eyelets and an excellent looking logo patch on the tongue. Furthermore, it has a dual density bottom and a well-cushioned midsole to enhance underfoot comfort, while also being made with a shock absorbing heel for extra comfort. The outsole is made of rubber and has a razor cut wave-siping to enhance traction. You can easily find a color that matches your favorite clothes as well as different fitting sizes. Constructed with a soft and genuine leather upper, Dockers Vargas Handsewn Boat Shoe is extremely comfortable and will last you for very long. Its footbed is well cushioned and it also has a molded EVA heel cup for exceptional foot comfort. Generally, it has a flexible handsewn construction which makes it great for all day wearing. It provides maximum traction on slippery or wet surfaces due to its siped rubber outsole and you don’t need to worry in case you have a wide foot because it’s wide enough for most men’s feet. Available in great looking colors that you can easily match with your clothes, it also allows you to find a perfect fit since it comes in numerous fitting sizes. 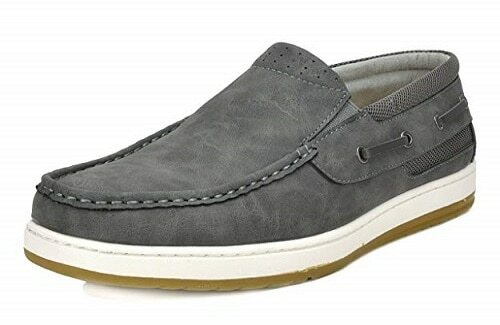 Global Win Boat Shoes are constructed for great performance and feature faux based leather upper and slip-on design for quick and easy on/off wear. Furthermore, they have an amazing moc-toe design to give you an all day long classy look. You can easily find a size you normally wear and a color that can match your wardrobe from the available varieties. This product has a cushioned footbed and soft lining on the inner sides to provide you with an all day long comfort. The outsole is rubber based and designed to increase traction on wet surfaces. Even though the white sides of the outsole get dirty quickly, you can easily clean them with just a simple cloth wipe. Practical and well constructed, Sanuk Boat Shoe will not only make your feet look good but also give you long-lasting comfort and more walking mileage as compared to other brands. Expect a great walking comfort since this item has a removable EVA footbed that’s well cushioned. It also has an antimicrobial additive in the footbed that helps prevent bad odor. Its elegant design features a good looking Canvas upper with a nice, custom printed liner. In addition, it has a true vulcanized construction with U shaped rubber outsole. The lighter and more breathable design is what sets this product apart from similar ones out there. They may feel a bit tight at first, but they stretch after some time to fit perfectly. With pure leather and breathable mesh on the upper, Margaritaville Anchor Boat Shoe is very comfortable and extremely easy to wear. For exceptional comfort, its interior is fitted with a foam insole that gives a perfect and soft feeling. Furthermore, it’s designed with a soft padded collar and tongue. The classy looking design features a colorfully printed anchor that’s on the rubber outsole and a fantastic contrast stitching. Unlike other similar products in the market, the breathable property of these boat shoes helps keep your feet fresh and comfortable throughout the day. With a genuine leather upper and breathable and lightweight design, Sperry Top-Sider Billfish is exceptionally comfortable and sturdy. It comes with a cushioned footbed and soft material lining on the sides to offer your feet with more comfort while walking or standing. It will look great on your feet given the classy design that features a shaft that measures approximately low-top from the arch. It also has a slotted collar and a moccasin stitching at the toe. The outsole is made of rubber and doesn’t leave marks on the floor. This shoe is ideal for warm weather due to its breathable properties. With a great odor control technology, Rugged Shark Boat Shoe is the best at keeping your feet feeling fresh and comfortable all day long. Even if you’re not a big fan of socks, you can comfortably wear it barefoot without worrying about sweaty or stinky feet. Thoughtfully constructed to last, it has a bottom that’s fully stitched for durability. Its upper is also built with long-lasting leather. Furthermore, the upper is fitted with a lining that gives it a casual look. It is also perfect for any indoor or outdoor surface due to its non-marking and slip-resistant rubber outsole. No matter your preferred style, Bruno Marc Boat Shoe will look great on your feet and earn you plenty of compliments from friends and co-workers. The footbed is handmade and cushioned with latex to provide your feet with exceptional, all-day-long comfort. It’s also lightweight and has a flexible construction for extra comfort. Its stylish design features a nice stitching vamp, a moc toe and a heel height that measures approximately 0.5 inches making these shoes easy to walk with. Note that the sizes can be a bit loose, therefore you should order half a size down for a comfortable fit. Sebago Schooner Boat Shoes have a unique design that features a true moccasin construction that wraps the feet in a single piece of leather to make a unique fit for you. The lace-up closure design helps promote a secure fit, especially where the shoes feel a bit lose. This item also has a footbed that’s cushioned with an EVA heel cup for ultimate comfort. Most men love the classy looking design of this shoe that makes it great for numerous casual and formal occasions. Tested for great performance on wet surfaces, you can comfortably wear this product without the fear of falling down even on a slippery floor. A lot of effort has been put in the design of Dexter Benton Boat Shoe and this is precisely what makes it very comfortable to wear and exceptionally long-lasting. The interior is fitted with a soft lining material on the sides and soft foam on the footbed to provide your feet with exceptional comfort. You can expect ease of movement while wearing this shoe because it’s lightweight and fits precisely as anticipated. Its great looking design features fantastically detailed stitching on the upper, a thick synthetic outsole and mesh that makes it breathable. Constructed with leather and mesh on the upper, Sperry Lanyard is both durable and comfortable to wear for most of your daily routines. You don’t need to worry about stuffy feet while wearing it because the mesh on the upper allows great air circulation to prevent bad odor and keep your feet feeling fresh throughout the day. The interior is fitted with a soft lining on the walls and a comfortable material on the footbed that feels extremely nice on the feet. It also has soft padding on the heel for ultimate comfort. The lace-up design enables you to make it a little tighter for a perfect fit in case it feels loose. The outsole is made of a thick rubber for durability hence you can rely on this shoe for a great performance that lasts. Columbia Vulc N Vent Shore is designed with 100% textile and washed canvas to give you the best comfort, a great look and long-lasting performance. Apart from the stylish look, it features detailed stitching on the upper and has an internally vented footbed that allows air circulation to keep your feet feeling fresh at all times. The interior wall is also fitted with a soft lining material to help enhance comfort while walking or standing. The toe-end is wide enough to allow your toes to spread freely. The outsole is made of high-quality rubber that’s non-marking and solid enough last you for a pretty long while. There is a lot of great benefits that come with Sperry Gamefish 3-Eye Boat Shoe. To begin with, it has a patented technology known as SON-R which features a unique outsole and footbed. The SON-R technology allows the footbed and the outsole to interact to give natural sensory feedback that promotes agility and stability. It also has a removable and lightweight midsole that gives cushioning and absorbs shock. Secondly, it has a 360-degree lacing system, a feature that’s hard to find in many other brands. This lacing system gives comfort and allows a great fit with rust resistant eyelets. Adaptive wave-sipping disperses water underfoot in order to minimize slippage while walking on the wet floor. Boat shoes are understood to fall somewhere between casual and smart on the scale of formality, but it all depends on how you wear them and pair them with other clothing items. Generally speaking, stay away from wearing visible socks with your boat shoes. Men’s jeans are traditionally acceptable to wear with boat shoes. They can be worn with light wash denim for a casual, breezy summertime look, or with darker wash jeans for a slightly more posh approach. Chinos are other acceptable pants option to be paired with boat shoes. As a slightly smarter alternative to jeans, a nice pair of chinos combined with boat shoes are excellent for occasions such as more casual summertime weddings or perhaps a rooftop bar party. For a more daring look that pops, you can try pairing your boat shoes with a pair of colored pants or pastel chinos. Boat shoes can be worn with knee-length shorts to elongate your legs and make you appear taller. Because of their summertime, beachy look, boat shoes can also be dressed down and worn to the beach with your trusty pair of swim trunks. For a more posh, golf-course look, you can try pairing your boat shoes with an Oxford shirt. Some popular shades include pastel colors, which are great for warm weather. Boat shoes are also great accessorized with nylon belts (like the ones listed on this compilation of belts for men) or even an edgy pair of x and y suspenders for a vintage 1930’s feel. Because these are traditionally worn sockless, they can get a little funky. While a few brands of boat shoes do include machine-washable insoles, not all styles are so easy to clean. Which method you take to clean and maintain your shoes will depend mostly on how they are constructed. First and foremost, any leather boat shoes you purchase should be pre-treated to be water resistant. While leather shoes do hold up ok to water, waxed leather is your best bet for long-term durability. However, if you’ve gone ahead and purchased a pair that isn’t waxed, you can still treat them to be water resistant, you just need to purchase and apply a product like dubbing wax, which is also useful in protecting all types of wallets made out of leather. Remove all loose dirt. This can be done using a soft brush in combination with a clean, dry cloth. Next, prepare the shoe for cleaning by removing the laces. This allows you to clean all surface areas of the shoe without difficulty. Then, wipe the surface area of the shoe with a damp cloth and soap. Cover the whole body of the shoe, working the soap in very gently. Finally, wipe the soap off with fresh water, massaging out any stains as you go. Allow the shoes to air dry overnight or longer, if necessary. Alternatively, if you’re concerned about taking soap and a wet cloth to your leather shoes or you’re not keen on drenching all of them, you can use baby wipes to spot clean each shoe. In some ways, canvas can take more abuse than leather and requires less gentleness to clean. In fact, some canvas shoes can even be machine washed. However, always check the label and hand wash them if you’re not certain. First, prepare a solution of warm water and liquid detergent. As with the procedure for leather shoes, go ahead and remove the laces. Next, get a soft bristled brush (though with canvas you can go a bit harder) and spritz the brush head with the solution. Then, scrub the shoe, giving special effort to the stained areas. With canvas, it’s okay to scrub a little. Finally, rinse in warm, clean water, trying to minimize saturation of the bottom of the shoe. Always let shoes air dry, never in a machine. 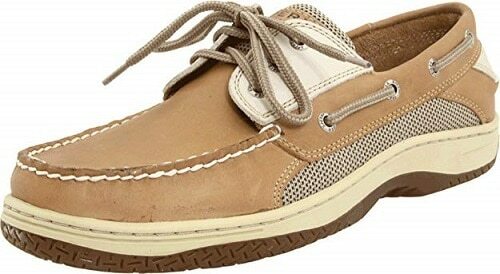 Besides leather and canvas, other less-common boat shoe materials can be gently spot cleaned or wiped. Additionally, to spruce up the rubber soles of shoes, mix water and vinegar together for a stronger cleaning solution, and scrub it with a cloth and/or brush. 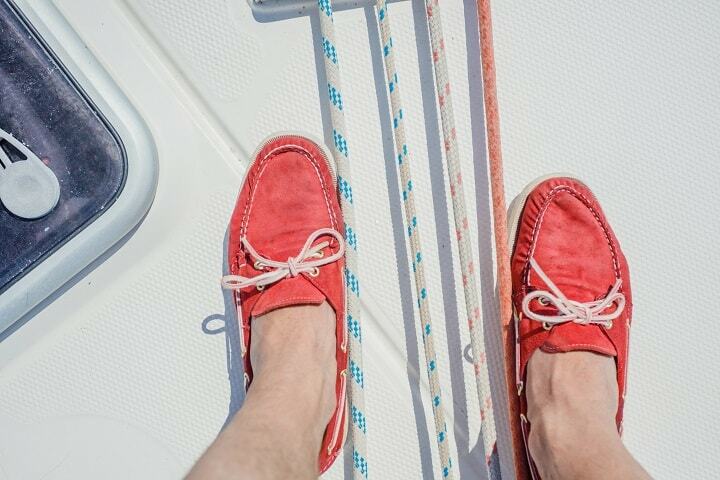 Because they are traditionally worn without socks, boat shoes can get smelly fast. To banish the nasty odor that might accumulate over a couple summers, utilize the natural properties of baking soda. Simply fill the shoe with the powder, place it in a bag, and shake vigorously. This works the odor-eliminating baking soda into every crease and corner of the shoe, giving it a chance to stomp out odor where it reeks the most. The goal is to coat the interior of the show entirely in baking soda. Then, allow the shoes to sit overnight before cleaning them out. To go the extra measure in fighting odor, you can also freeze the shoes to kill bacteria. Simply place them in a ziplock bag and seal them in your freezer for two days or 48 hours. Then, place in the sun or dry with a hairdryer, like one of these best hair dryers for men. Can you wear socks with boat shoes? While technically there are no federal or state laws on the stylings on boat shoe fashion, we recommend you try to stay away from wearing socks with boat shoes. Besides the fact that socks can get soggy and uncomfortable, they also look a little goofy with the shoe’s abbreviated toe and exposed foot. If you absolutely cannot stand the feeling of shoes on your bare feet, purchase a pair of socks for men which are ultra-no show socks which slip and secure just over the toes, keeping out of sight when the shoe is on. For your sake, we sure hope so! On both the outer sole of the shoe which comes in contact with the ground and the inner sole that cushions your foot, the ideal pair of boat shoes should be non-slip. However, as this shoe style moves more and more away from functionality and steps towards a fashion piece, some styles have less or no grip. Although many boat shoes styles are water-resistant, they normally aren’t waterproof (and frankly shouldn’t need to be). Afterall, these are boat shoes, not water shoes–the goal is to keep both feet firmly placed on land. Therefore, the ideal pair of boat shoes are going to be water resistant and able to handle splashes, puddles and seaspray, but shouldn’t ever need to be submerged. If you’re looking for kicks to take a swim in or wade through shallow lakes, you’ll want to invest in a pair of waterproof swim shoes instead. Over the years, boat shoes have stepped onto the fashion scene and asserted themselves as a timeless classic. Both functional and fun, perhaps the best thing about a pair of these is that they wear and age well. Like a bottle of fine wine, boat shoes mold to your foot and wear into style. Whether you’re out for a nautical jaunt or just looking to spice up your wardrobe, boat shoes are a great addition to your summertime shoe collection. Photos from: bondarillia / depositphotos.com, mac_sim / depositphotos.com, Elnur_ / depositphotos.com, dvoevnore / depositphotos.com, sergeypeterman / depositphotos.com, mac_sim / depositphotos.com.